Spring thaw. 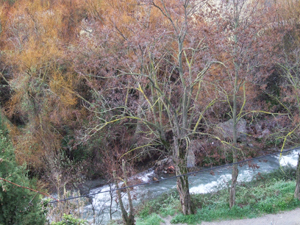 View from the terrace down to the river below the Gallinero. Listen carefully. Hear the river? And the nightingales? Deposit to confirm booking: 30% of accommodation cost and workshop fee (if you’re doing a workshop, as well). Balance of fees payable on arrival. Hide the beer and seal meat, Nanook and his woman may have to check this out. Congratulations on the rehab. I wish, (SNIFF SNIFF) I had my old studio back…. I’d mentioned to Mike the possibility of us coming over there for some serious work (including lots of peripheral looking). We are interested in anytime from November 2010 to and thru April, 2011 and would like to have it be a fairly lengthy stay-something like a month or so. We’d combine w/ visits to Barcelona and Madrid. B – look up our website – is not only a sculptor, but a fine draftsman (woman) with some printmaking in her background; would like to explore reduction woodcuts. We have a home in central Colorado, 25 minutes from premier skiing and a morning’s drive to Denver, Colorado Springs or Taos/Santafe. Also studio of sorts with a good etching press. We would consider an arrangement by which a housing exchange might be possible-we rent to someone there, and in exchange/payment they would compensate you. Not the only way to go. Any possible time slots to consider? I’ll try to call you in late a.m. here, evening , I think, over there. On the 27th, Friday.